The funeral of Singapore’s founding PM Lee Kuan Yew, who died on March 23 at the age of 91, is being held in the city-state. Despite torrential rain, thousands of people are lining the streets to view the funeral procession carrying Lee Kuan Yew’s coffin from parliament, where it has been lying in state, across the city. Following a state funeral attended by world leaders, Lee Kuan Yew’s body will be cremated in a private family ceremony. One million people have visited tribute sites this week, say local media. More than half a million people – 12% of Singaporean citizens – visited Parliament House to see Lee Kuan Yew ‘s coffin, while at least 850,000 others went to community sites to pay tribute. The funeral procession began on Sunday, March 29, at 12:30 PM as Lee Kuan Yew’s body was taken from Parliament House on a gun carriage. A 21-gun salute sounded, echoing across the city, as the procession moved on into the business district and Tanjong Pagar, the docklands constituency Lee Kuan Yew represented for his whole political life. Military jets flew overhead while two Singaporean navy vessels conducted a sail-past of the Marina Bay barrage – the massive water conservation project spearheaded by Lee Kuan Yew. Despite the pouring rain, crowds lined the route. They have been waiting almost silently but erupting in cheers and shouting Lee Kuan Yew’s name as the procession passes by. The funeral service is expected to begin at 14:00 at a cultural centre in the west, with foreign leaders including former President Bill Clinton, Indian PM Narendra Modi, Indonesian President Joko Widodo, Japanese PM Shinzo Abe, Australian PM Tony Abbott and UK House of Commons leader William Hague attending. The country will also observe a minute’s silence in the afternoon before singing the national anthem. The private cremation is taking place at the Mandai crematorium. 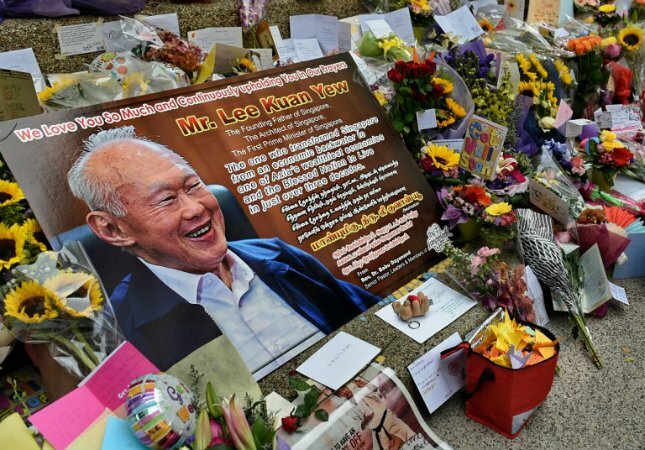 Singapore’s current PM Lee Hsien Loong, who is Lee Kuan Yew’s son, has described the past week as a “deeply moving experience” saying Singaporeans had “expressed their grief overwhelmingly”. Many of the city-state’s shopping and commercial centers are expected to be closed on Sunday as a mark of respect to Lee Kuan Yew. Lee Kuan Yew was Singapore’s prime minister for 31 years. He stepped down in 1990 but remained hugely influential in political life and was held in deep affection by Singaporeans. Lee Kuan Yew oversaw Singapore’s independence from Britain and separation from Malaysia, and was widely respected as the architect of Singapore’s prosperity – the city-state’s GNP per capita increased 15-fold between 1960 and 1980.